I’m always picking up stuff and putting it into my pocket. Agates, seed pods, acorns, whatever. Then I collect all those items in my craft room (the room that is presently non-existent) for use on some project, some day in the future. Sometimes, found items grow dust on the tins on the ledge of the window over the kitchen sink until I get around to dropping them into the Found Items box. 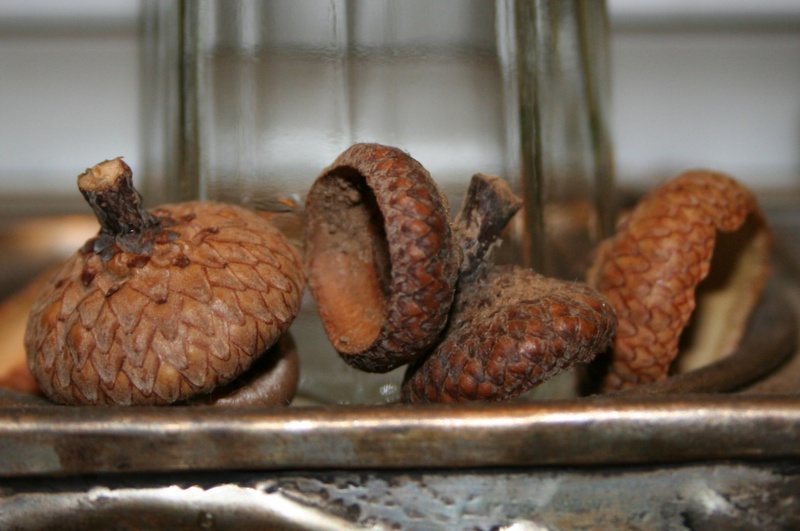 That is the case for these acorn caps (I suppose there’s an actual name for that part of the acorn that holds the seed): they are languishing on a tin in the window. That’s OK: they remind me that I will one day get around to making some sort of craft (most likely some sort of creature) utilizing the little caps. I dreamed about getting out my oil pastels the other night. It was a strange dream: I couldn’t find my water color crayons and was getting frustrated, then I remembered that I keep them in a briefcase which is currently stored in a closet. I could see the little tin I keep the crayons in, and the palette of color quite vividly. Then I woke up and went about my day until I had to get something out of a closet and there was the briefcase – and I remembered the dream with clarity. I don’t know if I was dreaming that I should get the briefcase out and load it into my truck (to paint during my lunch hour) or if I was just reminding myself that I have the paints and I will get to paint again. The biggest problem with our current living situation is that I do not like to paint or create when other people are around. It is a solitary endeavor and one that cannot be pursued with little people underfoot. I’m not nearly patient enough and am rather possessive of my creations. Don’t color on my piece of paper, please. And thank you. But being creative is part of who I am and I can’t keep it under an acorn cap too long. Pretty soon, it is going to have to bust out somewhere. I am already redesigning my craft room for when the kids move back out. Meanwhile, I will continue to pick up odds and ends on my walks and I will deposit them on the tins in my kitchen window. And I’ll haul the briefcase out to the truck with a bottle of water so I can start painting during my lunch hour again. And I thought this post was going to be about acorns. Look, Faerie helmets!! Your dream could have been both….to remind you that you have the paints and to not let go of the dream of painting…. I knew your post wasn’t going to be about acorns as soon as I saw the picture. I knew it would be about something wonderful you intended to do with them. Those were some of the first posts I read of yours when I found you – your creative wonderfulness!